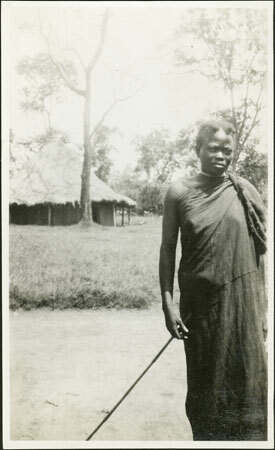 A portrait of a woman in a homestead wearing a textile body wrap and holding a stick, identified as dia Kamanga, i.e. the wife of Kamanga. Elsewhere she is also known as Nalihe wiri Bamina (i.e. Nalihe daughter of Bamina). Nalihe was Kamanga's second wife, who he married in the district of Bagomoro during E-P's fieldwork. Notes on card mount m/s pencil - "SS overall 8.89"
Morton, Chris. "Zande woman in homestead" Southern Sudan Project (in development). 03 Jan. 2006. Pitt Rivers Museum. <http://southernsudan.prm.ox.ac.uk/details/1998.341.742.2/>.